Well, friends and readers, this is our last blog post for the next two weeks since we are both going to be out of the country!!! Aileen will be on her honeymoon in Mexico and Ellen will be traveling around Europe with her husband. We will miss you guys, but we are leaving you in good hands–we have some awesome guest bloggers lined up that we know you’re going to love. Since we obviously have travel on the mind, we thought we’d leave you with some travel-inspired wedding ideas! 1. Globes. Use them in your centerpieces to add character and save money on flowers! Left via Project Wedding, right via Clayton Austin. 2. Postcards. Have guests write their well wishes on the backs of old postcards for your guestbook (middle image via Style Me Pretty). After the big day, you could send out thank you postcards with a wedding photo on the front, via Martha Stewart Weddings. 3. Vintage Suitcases. Have your flower girls carry them instead of a basket via Green Wedding Shoes . 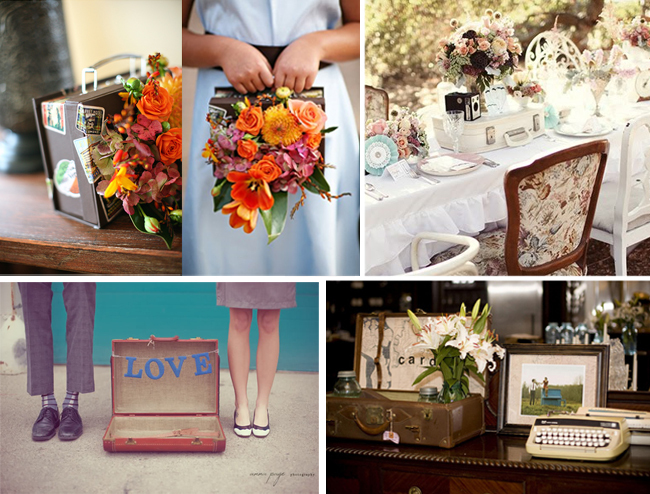 Use them as centerpieces via Green Wedding Shoes or as a card box via Style Me Pretty. Have them as a prop via Love and Lavender. 4. Paper Airplanes. Have the guest throw airplanes instead of rice via Make Moments. 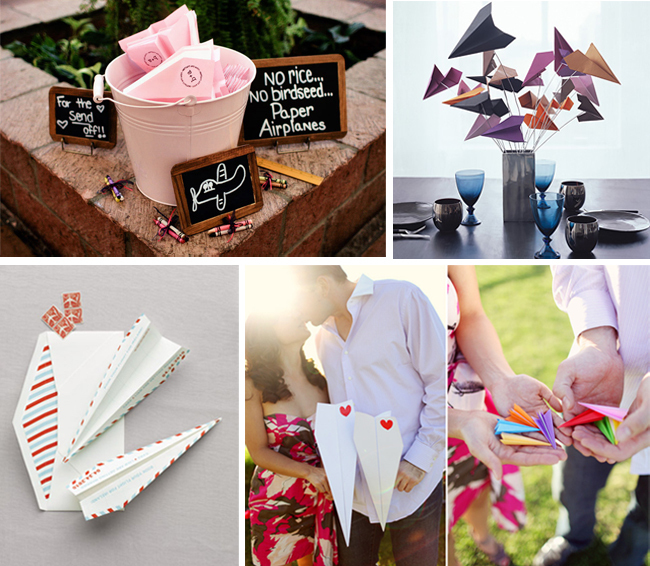 Use them as centerpieces via Wedding Bee or to send off for save the dates via Martha Stewart. Simply add them to your engagement session via Adrienne Gunde. 6. Paper Luggage Tags. 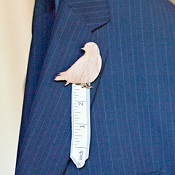 They make adorable placecards, especially when tied onto airmail envelopes, via Style Me Pretty. They’re also perfect for save the dates, via 100 Layer Cake! Love, love, love the maps! The colors on the globes match the flowers so beautifully, it’s almost eerie. This is delightful. What gorgeous, lovely details! We love to travel and have a collection of fun, vintage postcards we’ve collected. What a great idea to have guests write memories, well wishes, and funny stories on them! 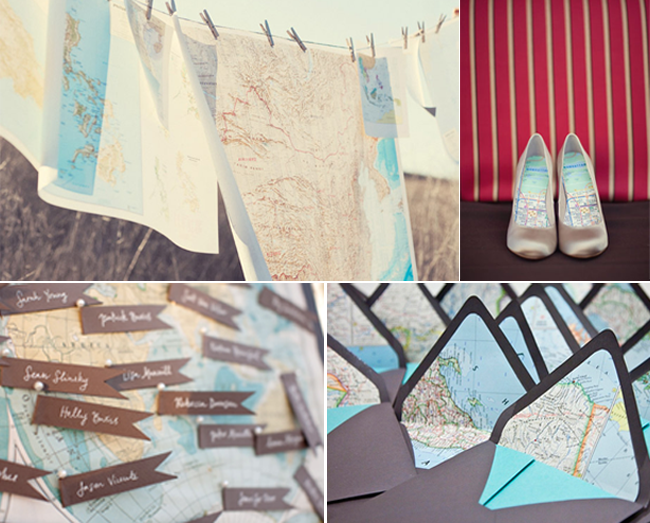 I love this wedding so much- the globes and the maps, so beautiful. LOVE the colors in that first pic! loving these ideas! safe travels, girls!